Breakaway compensation plans are the oldest of the three common plan types. They’ve been around since the 1970s. To this day, they’re the most popular compensation plan among party plan companies. A breakaway compensation plan uses two primary bonuses and two defined sales force classifications: sales people and sales leaders (also known as breakaway distributors). Each type is compensated differently. Sales people are paid a commission on group volume. Sales leaders continue to get that group volume commission but they also get a generation commission. Salespeople get paid a commission on their group volume. This is typically either a level commission or a stairstep differential commission. A level commission pays distributors a percentage on a certain number of levels of their downline. A stairstep commission is a type of differential commission that is comprised of progressive steps which have specific requirements; as distributors meet the requirements to climb the steps, they earn increasing percentages on their personal and group volume. The division between groups is marked by the positions of breakaways in the tree. Let’s say we have a distributor named Karen in the tree. Her group is defined as everyone beneath her who hasn’t reached the breakaway rank. When someone beneath her reaches a breakaway rank, that person literally breaks off into their own group. All the volume generated beneath the breakaway is now in that breakaway’s group. Let’s say Karen is a salesperson just starting out. Here’s what her group looks like right now. Here, Karen is receiving a level commission payout. She gets 5% on each member of her group. She’s inside the group of the breakaway above her but everything below her up until the next breakaway is her group for payout purposes. In a level commission, she gets a certain percentage on a certain number of levels. Here she qualifies for two levels and she get 5% on all the volume she qualifies for. If everyone in this tree generates $100 of personal volume (PV), she’ll get a $20 commission. If I’m at rank 4, and a rank 1 beneath me generates $100 of volume, but there’s a rank 2 between me and that rank 1, I get 15% minus the rank 2’s 5%. Here’s Karen again, but now she’s getting a differential commission. As a rank 3, she qualifies for 10% on all the rank 1s beneath her, but she’s blocked from getting paid on the volume from two of them because another rank 3 has already taken that 10%. If everyone generates $100 of volume, Karen gets $10. Now let’s look at Karen’s commission if she becomes a breakaway. Karen is now the breakaway distributor which means she’s at the top of the differential. She gets paid the full percentage she qualifies for on everyone on her first level, but at the lower levels, she’s getting the difference between what she qualifies for and what’s already been taken. She has a rank 1 beneath her with a rank 2 in between. The rank 2 takes 5%, leaving 15% for Karen. She has three rank 1s beneath her with a rank 3 in between. The rank 3 takes 10%, leaving Karen 10%. The next breakaway beneath Karen is a rank 5, like her, so she isn’t qualified to be paid on his volume, and because he takes the remaining differential for the distributors beneath him, she doesn’t get a differential commission on any of them either. 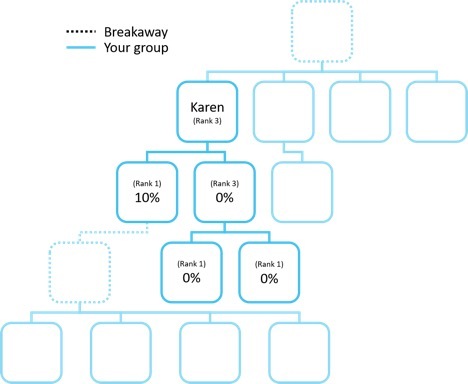 As a sales leader, or breakaway distributor, Karen is paid that same group volume commission but she also gets a generation commission which pays a percentage on the group volume of breakaway distributors beneath her. This is often called a sales leader override. 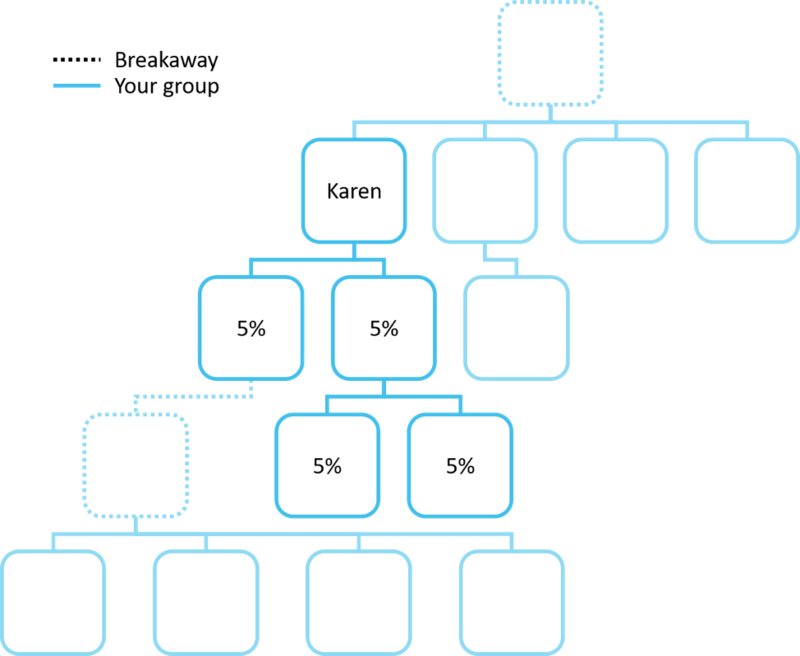 The percentage Karen is paid on the generations beneath her is less than what she’s paid on her own group. We’ve reverted to the level group volume commission for the sake of ease, but remember this is only one way that bonus can pay. 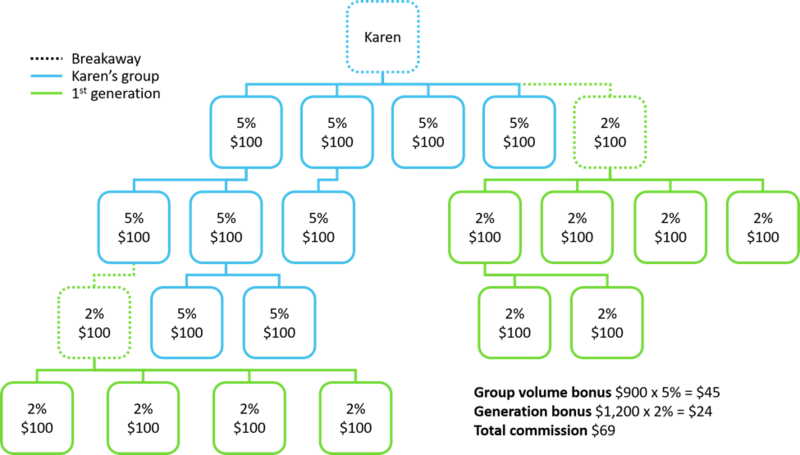 Again, if everyone in this tree generates $100 PV, Karen gets a $45 commission on her group (5% of $900) and a $24 commission on her first generation (2% of $1,200), and a $5 commission on her second generation (1% of $500). These percentages are just examples—each plan will have its own specific rules for how much distributors get on each generation. A breakaway/sales leader is always going to make more money on their group volume—on the distributors in their immediate downline—than they make on the breakaways/sales leaders in their downlines. 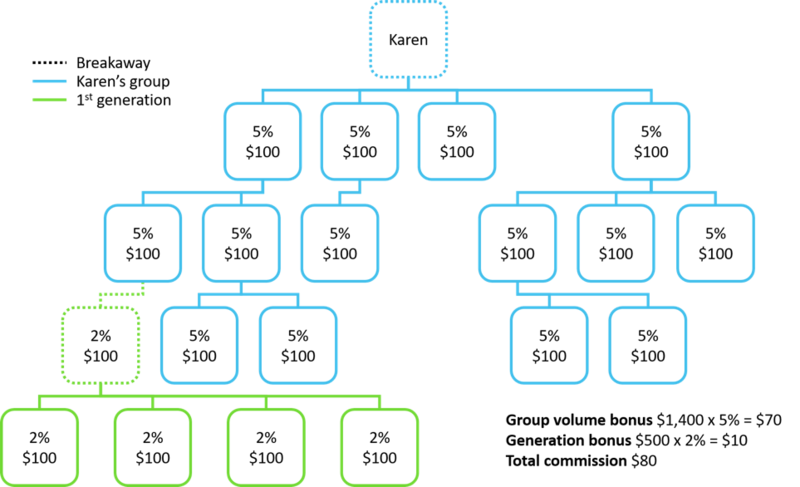 On group volume, Karen may earn as much as 15-25%, and on her breakaway volume, she may earn as little as 3-6%. Distributors have to keep an eye on their organizations, anticipate when downline distributors are going to break away, and prepare accordingly to stay qualified. But even if Karen stays qualified as a breakaway, she’s going to lose some commission dollars when someone beneath her breaks off. Note that in the example above, the commission she received at the beginning was greater than the commission she received at the end. Let’s look at a more detailed example. Karen’s organization grew, but her pay went down. This is a downside to the breakaway. The pay can change radically from month to month. This can be frustrating for your distributors but it also incentivizes them to continue enrolling and building their personal group. One of the real advantages of this plan is that because you have two commission types specifically set aside—one for paying salespeople and one for paying sales management—it’s much easier to set the percentages and qualifications to achieve the desired results. Consequently, professional distributors of both kinds can be better taken care of with this plan. The plan does a great job of paying salespeople. Of all the standard compensation plans, this one has the strongest potential in this area. Reaching the breakaway rank allows Karen to make a lot more money on her customers and brand-new distributors—those who need her help. Consequently, she has a lot more incentive to work with them. On the people who have advanced to breakaway/sales leader, she’s now earning a smaller percentage. However, since she gets paid down numerous levels of sales leaders—successful people—this means she gets paid on a lot of group volume. The plan uses level commissions for paying sales leaders. That is the most successful method for paying sales management commissions. The fact that this plan has defined a certain commission type to pay salespeople and another commission type to pay sales management simplifies the design and creation of qualifications. This plan is sometimes viewed as a compromise plan. 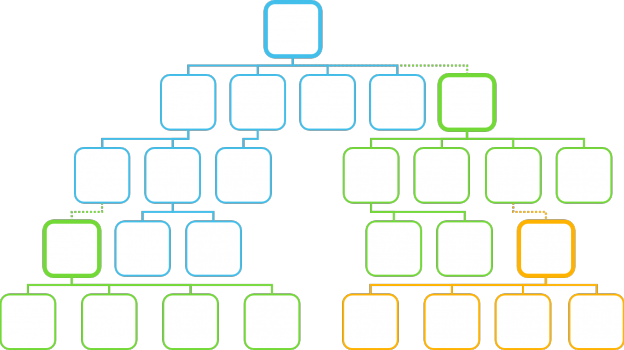 Because many people—probably 90%—don’t build their own organization, they stay in other distributors’ personal groups. When two people in a line have the same rank, the differential is zero. 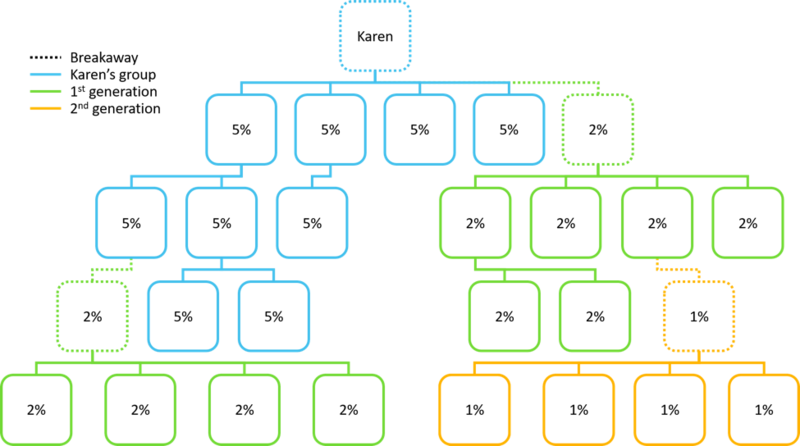 This plan creates a treadmill effect: Each time Karen brings someone in, she has to qualify those group volumes, and as people break away, she has to replace that lost volume. They can be confusing and difficult to explain.